Mental ill health is not an inevitable part of ageing, but for many older people it may feel that way. Growing older can make people more predisposed to conditions such as dementia and delirium, while higher rates of social isolation and bereavement among this group leave individuals vulnerable to depression. Difficulty in accessing mental health support is a long-standing issue affecting older people. While Age UK found that nearly half of over-55s have experienced depression, the Royal College of Psychiatrists believes 85% of older people with the condition receive no help from the NHS. To meet this need, NHS England has launched the website MindED for Older People, which provides accessible and reliable information about mental health for individuals and their carers. NHS England national clinical director for dementia and older people's mental health Alistair Burns says the website produced in partnership with Health Education England is a ‘game changer’. ‘It plays a crucial role in raising the profile of mental health issues in older people and providing information about their significance, and assessment and treatment options,’ he says. The website covers memory loss, depression, delirium, dementia, lack of sleep and loneliness among other issues and sets out how and where to seek advice and support, as many older people with mental ill health do not ask for help. Age UK says that while numbers affected by mental health problems are not higher than for other age groups, older people receive much less support. The most common triggers for mental health problems are bereavement (36%), ill health (24%) and financial worries (27%) according to a survey of more than 1,600 people over 55 conducted by the charity last year. One in five of those who reported experiencing anxiety or depression said symptoms worsened as they got older. Age UK senior health influencing manager Tom Gentry says older people are six times more likely to be prescribed tranquillisers or similar medication, but much less likely to access talking therapies or counselling. A 2016 report from the charity found only 6% of people using the Improving Access to Psychological Therapies programme were 65 and over, trailing well behind the 12% target set by the Department of Health. Age UK was part of the consortium that developed the MindED for Older People site, which Mr Gentry says 'demystifies' some of the issues around mental ill health. He urges nurses and other healthcare staff to tackle stereotypes and stigma that may be barriers to people seeking help. ‘Older people say healthcare professionals sometimes think a low mood or grumpy attitude is a natural part of ageing,' he says. 'We want nurses to acknowledge when someone might have signs of depression. 'If they are planning care and don’t seem particularly engaged in decisions or the process, they may need additional support. Giving older people space to acknowledge they may have a problem, and there are things that can help, is important,’ adds Mr Gentry. Frimley Health NHS Foundation Trust consultant nurse for older people Claire Nelson says mental and physical health problems in older people are often bound together in a complex cycle. ‘When people think about mental health conditions, they mean depression and dementia, whereas the effect of social isolation on mental and physical health and quality of life is huge,' she says. 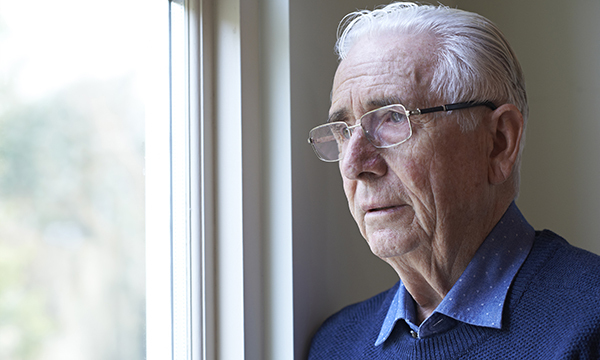 Frailty can be a significant factor in increasing social isolation, while social isolation and loneliness can contribute to frailty and increase its effect, Ms Nelson says. One in ten over-65s is living with frailty, rising to 25%-50% of those over 85. To improve the mental health and well-being of older adults living with frailty, nurses can request or carry out a comprehensive geriatric assessment. This holistic approach assesses cognitive function, mood, anxieties and fears, and this can lead to an individualised care and support plan, says Ms Nelson. In June, NHS England announced that people aged over 40 in England will be given advice on avoiding dementia as part of their free NHS health check. This followed its advice for primary care staff in Mental Health in Older People: A Practice Primer. Published last year, this covered taking a medical history and responding to depression, anxiety, bipolar affective disorder, psychotic disorders, delirium, personality disorders and alcohol problems. The guidance points out that older people are much less likely to volunteer information about mental health problems, partly because these issues become normalised in old age. Lead advanced nurse practitioner for care of elderly medicine at Abertawe Bro Morgannwg University Health Board in Wales, Wendy Mashlan, urges nurses to recognise that issues related to ageing and mental health are different, and to be alert to those with delirium and dementia. Delirium is a state of heightened mental confusion that comes on suddenly, particularly in older people, and requires a swift response. The RCN is running a campaign to train nurses and other staff to be delirium champions in recognition of the seriousness of the condition. The older people’s ward where she works takes an innovative approach by offering beds specifically for patients with mental and physical problems, understanding how the two are intertwined. These are for patients with problems such as dementia, delirium, challenging behaviour, severe depression and bipolar disorder. Only those with acute psychiatric conditions, who need acute mental healthcare, are excluded. There are nine million lonely people in the UK and 1.2 million chronically older lonely people, according to data from the Campaign to End Loneliness. Loneliness has a major impact on mental and physical health and research shows a lack of social connections is as damaging to health as smoking 15 cigarettes a day. Loneliness puts individuals at greater risk of cognitive decline, makes them more prone to depression and increases the risk of suicide in older age. A study in the Journal of Neurology, Neurosurgery and Psychiatry suggested lonely people have a 64% increased chance of developing dementia. Being part of a community is key to keeping well. The NHS, charities and third sector organisations run events including exercise classes, lunch clubs and support groups. One charity working to tackle the loneliness epidemic among older people is Contact the Elderly, which puts on free monthly tea parties across the UK. The social events, which are offered to 6,000 isolated older people, are usually hosted on a Sunday by a volunteer in their home. Each guest is picked up by a volunteer driver, who accompanies them to the tea party and drives them home afterwards. The charity's chief executive Meryl Davies says: ‘Breaking the cycle of loneliness can have a profound impact on health and well-being.